L.angustifolius L. 1753, Sp. Pl:721; Willd. 1803, l. c.:1024; DC. 1825, l. c.:407; Boiss. 1872, l. c.:28; Willk. et Lange, 1880, l. c.:466; Halacsy, 1901, l. c.:340; Aschers. et Graebn. 1907, Syn. Mitteleur. Fl. 6 (2):231; Fiori, 1925, l. c.:804; Plitmann, 1966, Israel J. Bot. 15:26; Chamberlain in Davis, 1970, l. c.:39; Zohary, 1972, l. c.:43, t. 57; Gladstones, 1974, l. c.:9; Vass. 1987, in Fl. Part. Eur. URSS, 6:214. – L. linifoliusRoth, 1787, Bot. Abh. 14, t. 5. - L. reticulatus Desv. 1835, Ann. Sc. Nat. ser. 2,3:100. - L. leucospermus Boiss. 1849, Diagn. Pl. Or. Nov. 9:8. - L. philistaeus Boiss. 1849, l.c. : 9. – L. angustifolius var. sativus et var.spontaneus Libk. 1931, Lupinus :53. - L.opsianthus Atab. et Maiss., 1968, Bjull. Glav. Bot. Sad. Acad. Nauk SSSR. : 75. - L. angustifolius subsp.angustifolius et subsp. reticulatus (Desv). Franco et Silva, 1968, in Fl. Europ. 2:105. 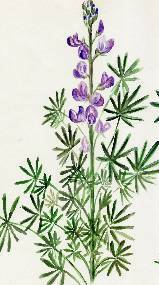 – narrow-leafed or blue lupin. Plants are 20–150 cm high. Stalks are sparsely sericeous, with numerous lateral branches. Leaves are developed from 5–9 linear-lanceolate or narrow-linear leaflets, 20–40 x 2.5 mm in size; the upper surface is glabrous, and the lower surface is sericeous. Stipules are linear and linear-lanceolate. The inflorescence is dense, almost sedentary, 5–20 cm long, placed on a short floral pedicle. Flowers are 11–15 mm long, almost sedentary; lower flowers are alternate, upper ones more or less subverticilate inside. Floral bracts are small-sized, easily falling. The calyx is bilabiate, profoundly bipartite; the lower lip is longer, entire or irregularly two- or three-toothed. The corolla is blue, violet, or, less frequently, pink and white. Pods are 35–50 x 7–10 mm in size, oblong, slightly inflated, 4- or 7-seeded, with oblique partitions between seeds. The seed are 4–8 x 3–7 x 3‒6 mm, globular, with smooth testa, variously coloured, with a triangular spot and a stria close to the hilum. 2n = 40. Occurs on meadows, among rocks, in bushes, on seaside sands and near reservoirs, along the roads and, as a weed, in the field. Tends to grow on well-ventilated soils. It is widespread in all Mediterranean countries and also in Asia Minor, Transcaucasia and Iran. Naturalized in Southern Africa and Southwest Australia. Widely cultivated in Northern Europe (Germany, Holland, Poland, CIS), in the southeast part of USA and in New Zealand. It is a rather polymorphic species. The variability of characters depends on eco-geographic conditions. Wild-growing races have, as a rule, narrow pods, smaller-sized leaflets and seeds, while the plants are not so tall. The size of seeds and their colouring vary over all the area of growing. Large-seeded plants usually occur closer to arable soils, while small-seeded ones are found on inshore sands and slopes. The colour of seeds varies from dark grey (almost black) with light spots and specks of miscellaneous size, greyish-brown and brown to light grey or white. Seeds with coloured testa usually correlate with cyan and pink flowers. In these two characters (traits) homologous variability is observed. Unpigmented (white) seeds are typical for white-flowered and lilac plants. These combinations of characters do not demonstrate any geographic arrangement. There is no abrupt gap between cultivated and wild forms. On the contrary, transition between them appears very smooth. Therefore there is nothing to justify the existence of two species (L. linifolius Roth. and L. opsianthus Atab. et Mais.) as well as two subspecies (subsp. angustifolius and subsp. reticulatus (Desv.) Franko et Silva.) differing only in the width of leaflets and the size of seeds (quantitative characters). In our opinion, it seems more correct to subdivide this species in a different way. 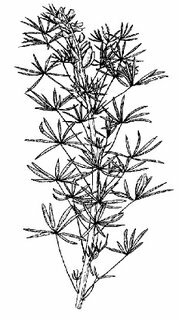 Using the developed criteria of intraspecific taxa, VIR’s blue lupin collection was screened to identify 13 varieties of L. angustifolius L. distinctly differing from each other in the colour of seeds and the corolla. Variations in the colour of cotyledons, vegetative parts and carina have been used for identification of 12 subvarieties. Besides, the plants with determined branching and fascicular stems are described as 8 separate forms. Classification scheme for Lupinus angustifolius L.
9. Var. sparsiusculus Kurl. et Stankev. 10. Var. brunneus Kurl. et Stankev. 1. Subvar. angustifolius. - Cotyledons and the carina`s edge anthocyan - coloured. We do not know, what kind of seed had C. Linnaeus in the disposal, but we think, that most likely described by him accessions was represented by domesticated example. It is possible to consider cv. Benyakonsky 484 (k-1457) from collection of VIR as typical accessions of this taxon. 1. f. angustifolius. - Side shoots absent or shortened, flowers axillary. Typus: ‘Mut-1’, Poland, k-2803, reproduction of Pushkin`s laboratories of VIR, 12.7.1989, B.S. Kurlovich (WIR). 2. Subvar. viridulus Kurl. et Stankev. 1990, l.c.:24. - L.angustifolius var. subcoeruleus Sypn. ex Atab. 1962, l. c.:129, nom. illeg. - Cotyledons and the carina`s edge green. Typus: Poland, k-334, reproduction of Pushkin`s laboratories of VIR, 14.7.1989, B.S. Kurlovich (WIR). 2. Var. albopunctatus Kurl. et Stankev. 1990, l.c.:24. - L.angustifolius var. maculatus Atab. l. c.:129, nom. illeg. - Flowers blue. Seed almost black with tiny white dots and spots. Typus: ‘Benyakonsky 335 ’, Belarus, k-1477, reproduction of Pushkin`s laboratories of VIR, 10.7.1989, B.S. Kurlovich (WIR). 3. Var. griseomaculatus Kurl. et Stankev. 1990, l. c.:24. - L.angustifolius var. subalbidus Sypn. ex Atab. 1962, l. c.:129, nom. illeg. - Flowers blue. Seed gray with white spots. Typus: Belarus, k-3148, reproduction of Pushkin`s laboratories of VIR, 14.8.1989, B.S. Kurlovich (WIR). 2. f. belorussicus Kurl. et Stankev. 1990, l. c.:24. - Side shoots shortened, flowers axillary. Typus: ‘Pershacvet’, Belarus, k-2955, reproduction of Pushkin`s laboratories of VIR, 7.7.1989, B.S. Kurlovich (WIR). 4. Var. chalybeus Kurl. et Stankev. 1990, l. c.:24. - Flowers blue. Seed white with sparse dark-brown and gray spots. Typus: ‘Frost’, USA, k-2258, reproduction of Pushkin`s laboratories of VIR, 21.7.1989, B.S. Kurlovich (WIR). 5. Var. corylinus Kurl. et Stankev. 1990, l. c.:24. - Flowers blue. Seed beige with browm spots. Typus: ‘Apendrilon’, Greece, k-2666, reproduction of Pushkin`s laboratories of VIR, 20.7.1989, B.S. Kurlovich (WIR). 3. f. zhukovskii Kurl. et Stankev. 1990, l. c.:24. - Side shoots absent or shortened, flowers axillary. Typus: ‘Line AT - D-2-T/5’, Belarus, k-2837, reproduction of Pushkin`s laboratories of VIR, 14.8.1986, A.K. Stankevich (WIR). 3. Subvar. purpureus - Cotyledons anthocyan - coloured, vegetative parts dark-violet. Typus: ‘Borre’, Sweden, k-1593, reproduction of Pushkin`s laboratories of VIR, 21.7.1989, B.S. Kurlovich (WIR). 4. f. deramosus Taran. et Busch. ex Kurl. 2002, Lupinus, St. Petersburg, Pub.house Intan:72. - Side shoots absent or shortened, flowers axillary. Typus: Belarus, k- 3527, reproduction of Pushkin`s laboratories of VIR, 14.8.2001, L.T. Kartuzova (WIR). 4. Subvar. rhodanthus Kurl. et Stankev. 1990, l. c.:25. - Cotyledons and vegetative parts green. Typus: Poland, k-1341, reproduction of Pushkin`s laboratories of VIR, 19.8.1989, B.S. Kurlovich (WIR). 5. Subvar. rubidus. - Cotyledons anthocyan-coloured, vegetative parts dark-green. Typus: ‘Vada-18’, Belarus, k –2679, reproduction of Pushkin`s laboratories of VIR, 18.7.1989, B.S. Kurlovich (WIR). 6. Subvar. maissurianii Kurl. et Stankev. 1990, l. c.:25. – L. angustifolius var. maissurianii Atab. 1962, l. c.:129, nom. illeg. - Cotyledons and vegetative parts anthocyan-coloured. Typus: ‘Northern - 3’, Moscow province, k- 1712, reproduction of Pushkin`s laboratories of VIR, 17.7.1989, B.S. Kurlovich (WIR). 5. f. epigonalus Taran. et Busch. ex Kurl. 2002, Lupinus, St. Petersburg, Pub.house Intan:73. - Side shoots absent or shortened, flowers axillary. Typus: Belarus, k- 3528, reproduction of Pushkin`s laboratories of VIR, 14.8.2001, L.T. Kartuzova (WIR). 8. Var. atabekovae Kurl. et Stankev. 1990, l. c.:25. - Flowers pink. Seed with white spots. It is close to var.griseomaculatus (3). Typus: ‘Gylcow’, Germany, k -1498, reproduction of Pushkin`s laboratories of VIR, 28.7.1989, B.S. Kurlovich (WIR). 9. Var. sparsiusculus Kurl. et Stankev. 1990, l. c.:25. - Flowers pink. Seed white with sparse dark-brown and gray spots. It is close to var. chalybeus (4). Typus: ‘Laf-rbc/2’, Belarus, k-2831, reproduction of Pushkin`s laboratories of VIR, 20.7.1989, B.S. Kurlovich (WIR). 10. Var. brunneus Kurl. et Stankev. 1990, l. c.:25. - Flowers pink. Seed beige with brown spots. It is close to var. corylinus (5). Typus: ‘Mirela’, Poland, k-2570, reproduction of Pushkin`s laboratories of VIR, 5.7.1989, B.S. Kurlovich (WIR). 7. Subvar. albosyringeus. - Cotyledons without anthocyan, vegetative parts dark-green. Typus: ‘ Nemchinovski 846 ’, Moscow province, k-1981, reproduction of Pushkin`s laboratories of VIR, 6.7.1989, B.S. Kurlovich (WIR). 6. f. kloczkovii Kurl. et Stankev. 1990, l. c.:26. - Side shoots absent or shortened, flowers axillary. Typus: ‘Ladny’, Moscow province, k-2648, reproduction of Pushkin`s laboratories of VIR, 2.8. 1986, A.K. Stankevich (WIR). 7. f. confertus Kloczko et Kurl. 1990, Bull. VIR, 206:82. - Stem fascicular. Flowers, pods and side shoots clustered at the top of the stem. Typus: ‘5M2-253’, TSKA, k - 2979, reproduction of Timiryazev Agricultural Academy in Moscow, 10.7.1990, N.A. Klochko and N.F. Anikeeva (WIR). 8. Subvar. polonicus Kurl. et Stankev. 1990, Bull. Appl. Bot. Gen. Pl.-Breed., Leningrad, 135:26. - Cotyledons and vegetative parts anthocyan – coloured. Typus: ‘ Muzin bialy ’, Poland, k-1851, reproduction of Pushkin`s laboratories of VIR, 25.7. 1989, B.S. Kurlovich (WIR). 9. Subvar. lilacinus Kurl. et Stankev. 1990, l. c.:26. - Cotyledons and vegetative parts light-green. Typus: ‘Timir-1’, Moscow province, k-2664, reproduction of Pushkin`s laboratories of VIR, 20.7. 1989, , B.S. Kurlovich (WIR). 12. Var. albidus Kurl. et Stankev. 1990, l.c.:26. - L.angustifolius var. leucanthus Harz. ex Atab. 1962, l. c.:129, nom. illeg. - Flowers white. Seed white with sparse brown spots. Typus: ‘Unicrop’, Australia, k-2096, reproduction of Pushkin`s laboratories of VIR, 5. 8. 1989, B.S. Kurlovich (WIR). 8. f. kuptzovii Kurl. et Stankev. 1990, l. c.:26. - Side shoots absent or shortened, flowers axillary. Typus: ‘Lanedex-1’, Belarus, k-2687, reproduction of Pushkin`s laboratories of VIR, 3. 7. 1989, B.S. Kurlovich (WIR). 10. Subvar. candidus. - Cotyledons and and vegetative parts without anthocyan. Typus: ‘ZLNR-2’, Belarus, k-3184, reproduction of Pushkin`s laboratories of VIR, 19. 7. 1989, B.S. Kurlovich (WIR). 11. Subvar. virescens Kuptzov et Kurl. 1990, l. c.:26. - Cotyledons anthocyan –coloured. Vegetative parts without anthocyan. Typus: ‘DM - green’, Belarus, k-2972, reproduction of Pushkin`s laboratories of VIR, 19. 7. 1989, B.S. Kurlovich (WIR). 12. Subvar. violaceus Kuptzov et Kurl. 1990, l. c.:27. - Cotyledons and vegetative parts anthocyan - coloured. Typus: ‘DM - anthocyaned’, Belarus, k-2971, reproduction of Pushkin`s laboratories of VIR, 19. 7. 1989, B.S. Kurlovich (WIR).